The Bicycle Man has a lot of experience getting people riding. We are glad to work with anyone to see how we can get you riding! Tricycles have low speed stability unmatched by any bike. They are easier to get on, start, stop and get off than bikes. Some of these trikes are low, light and sporty, they are called “tadpole” trikes. Tadpole tricycles have two front wheels and put you in a more reclined aerodynamic position. They have hand controls at your sides and are smaller, easier to transport in a vehicle. Some tadpoles even fold to fit in your trunk. Many riders find the tadpole trikes preferable for longer, more challenging rides. The other type of trikes is “delta” trikes with two rear wheel. The delta trikes are higher and easier to get into and out of and put you in a more upright seated position. Most delta trikes are less expensive and more suitable for shorter rides. All trikes offer greater low speed stability for riders with a wide variety of disabilities, making it possible for you to enjoy bike paths, trails, and roads. Your hand controls can be at thigh height or raised to a traditional handle bar level. 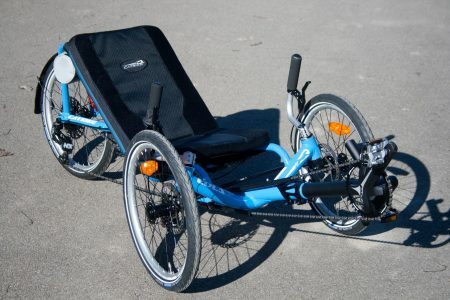 A recumbent trike may be all you need to get out on the road again. I think you will be surprised how easy and comfortable they are to ride. Those with mobility impairments, who have good balance and prefer two wheels may find the back support and the wide seat of a recumbent bike attractive. Various designs accommodate people in an upright yet reclined seated position or a more recumbent mode. The hand controls can be at thigh height or raised to a traditional handle bar level. A foot-pedaled recumbent trike may be all you need to get out on the road again, and will likely be more comfortable than you expect. 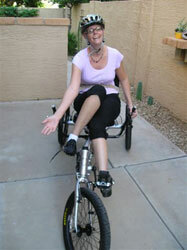 With a recumbent tandem bike or trike you bring a companion who can help with balance, control and navigation. Blind and visually impaired riders can enjoy tandem cycling with a sighted driver. Three wheeled recumbent tandems can remove the challenge of balance for both riders. This can be especially important when cognitive or coordination limitations are factors. 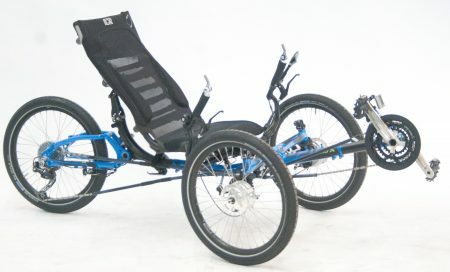 Some recumbent trikes can be “tandemized” by adding a coupler. This gives you a tandem with one driver and two riders who can pedal, coast and shift gears independently. Couples can ride attached through traffic or hilly sections where one needs help and then ride separate on bike paths where there is no traffic or hills. Even some people using wheelchairs can ride leg powered trikes. 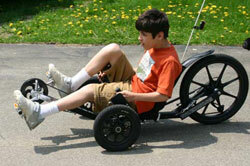 If you have limited use and strength in your legs an adaptive trike may be just right for you. You can build leg strength and flexibility while enjoying the outdoors. These bikes are a wonderful way to get out of a wheelchair and back to the joy, freedom and benefits of exercising outdoors. 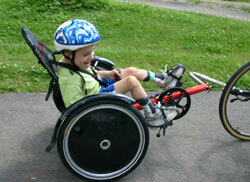 We have seen handicapped children do particularly well on adaptive trikes. One family brought their 9 year old son to test ride some trikes. When he walked in our shop with two forearm crutches I was cautiously optimistic. The coordination of pedaling was a challenge for him but he had no lack of motivation! His folks bought a Sun delta trike hoping he would be able to ride along with his Mom on her fitness walks. 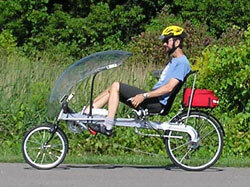 For younger riders under 4 feet tall there is the Hase Trets recumbent trike. Though it is a bit pricey it can be a great option for smaller riders. Another nice option is that it can be towed behind most bicycles as a trailer. Or it can be ridden as an independent trike as seen in this photo. 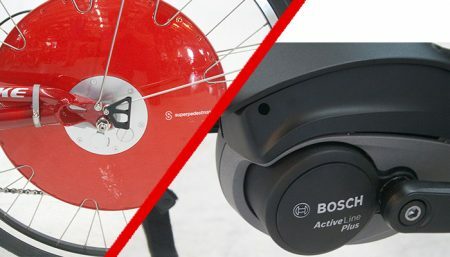 For riders with particular challenges we can adapt most recumbent bikes and trikes so that you can operate both brakes and all the gears with on hand. Custom extra-low gears give you extra-easy pedaling. Combined with the stability of a trike this gives you will be able to climb most paved hills slowly but easily. If your knees or hips are recovering after surgery or trauma stiffness or limited flexion can me a problem. 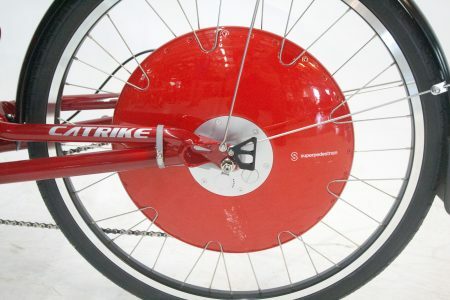 We can set up a recumbent bike or trike to help you overcome this allowing full 360 degree rotation of the crank arm. This can extend your rehab program into the great outdoors! Fitting shorter length crank arms allows most rehab riders to peddle even with restricted joint movement. Pedaling a full rotation often helps decrease joint swelling and can increase your mobility and strength. Al this form a fun outdoor aerobic activity! We stock crank arms as short as 145 mm (170 or 175 are standard.) If your knees get sore from riding a shorter crank often helps. Riders who are under ~5’4” tall or who have trouble getting their legs over the top of the pedal stroke can benefit from shorter crank arms too.